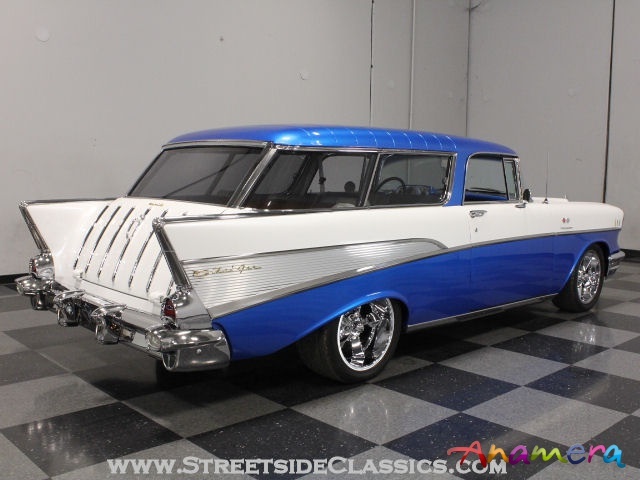 Before we go into the details on this spectacular 1957 Chevy Nomad, please take a few moments to look at the photos... Back? Good, because you can plainly see that this is one heck of a car. 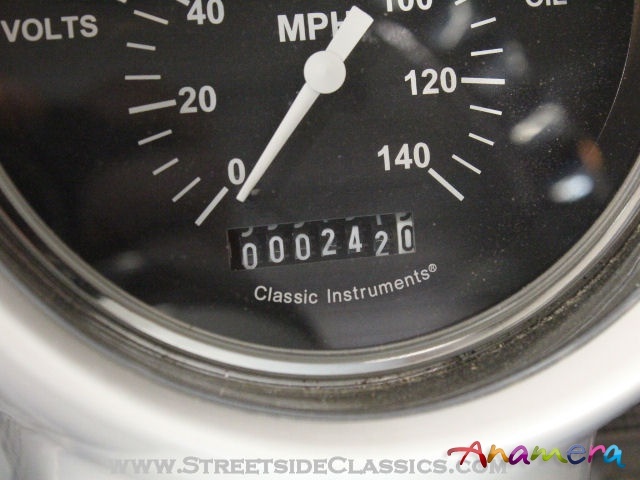 Professionally built, there's not a single surface or component that hasn't been tweaked, polished, rebuilt or replaced in some way, delivering what might be the ultimate rod for the guy with a family. 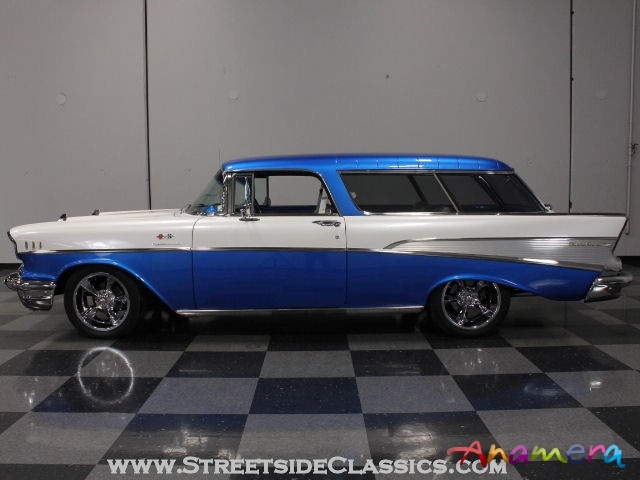 The '57 Nomad is arguably the best-looking of all the shoebox Chevys, so it didn't make sense to modify the sheetmetal in any major way. 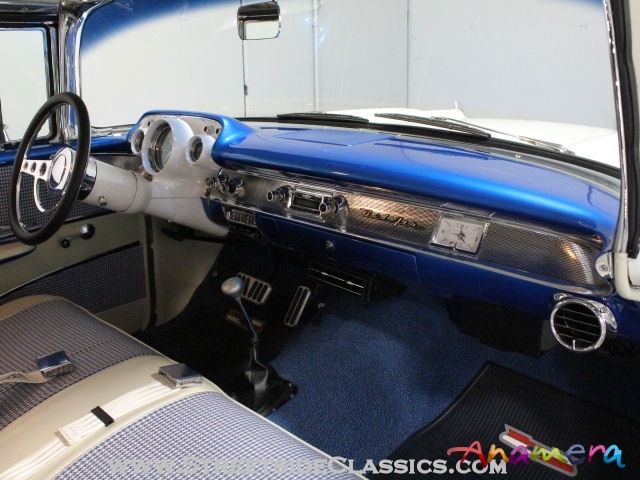 Instead, they spent the time and money on getting everything as straight as possible, then covered it in bright electric blue and white pearl paint using the factory trim to provide a two-tone that the factory never offered (but should have). As you saw in the photos, the surfaces are so smooth and flat that reflections show virtually zero distortion and the brilliant shine of the urethane paint is simply dazzling in the sunlight. 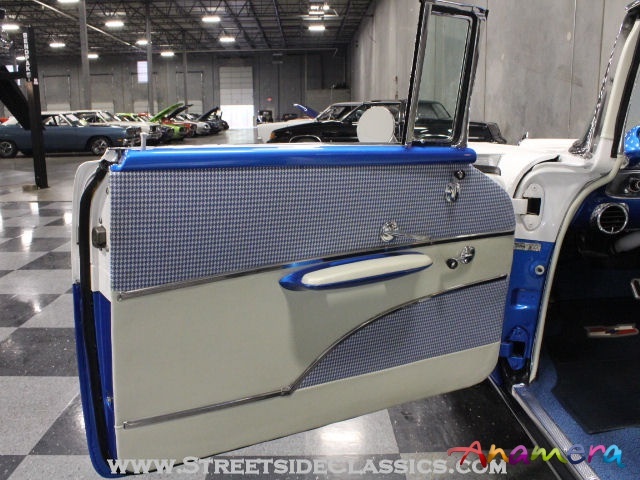 The anodized panel on the quarters adds a neat third element to the color combination, and things like the grille and hood emblem were properly gold anodized for a factory look. 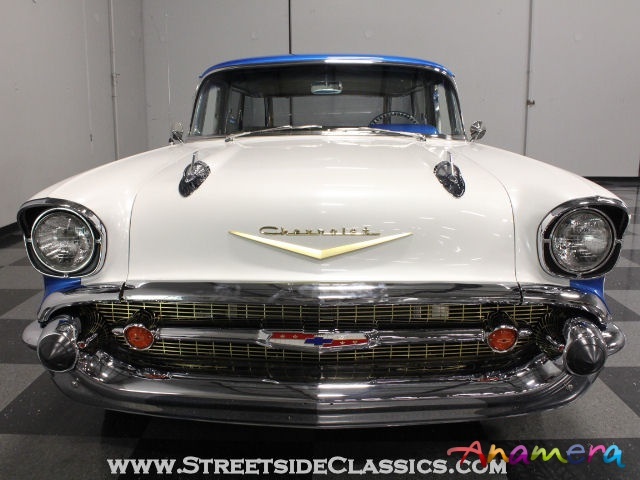 The rest of the chrome was treated to a show-quality re-plate, the stainless was polished up to match, and those Fuel Injection badges on the front fenders aren't just for show. There's more awesomeness inside where the combination of old and new is so tastefully done that it's hard to find the line. 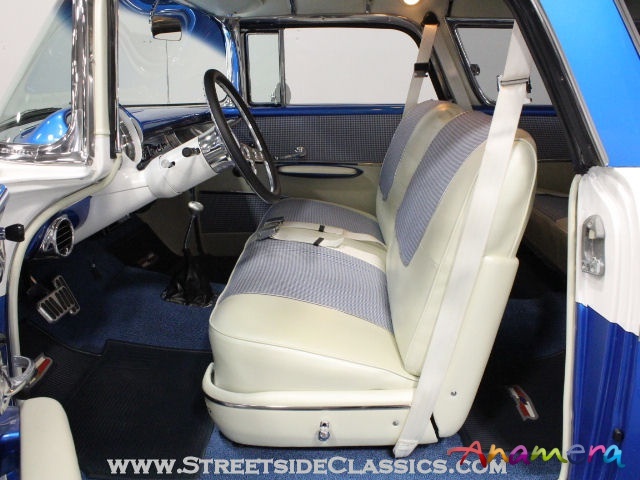 The blue and white houndstooth upholstery has a very OEM look, although it was obviously not stock in 1957. 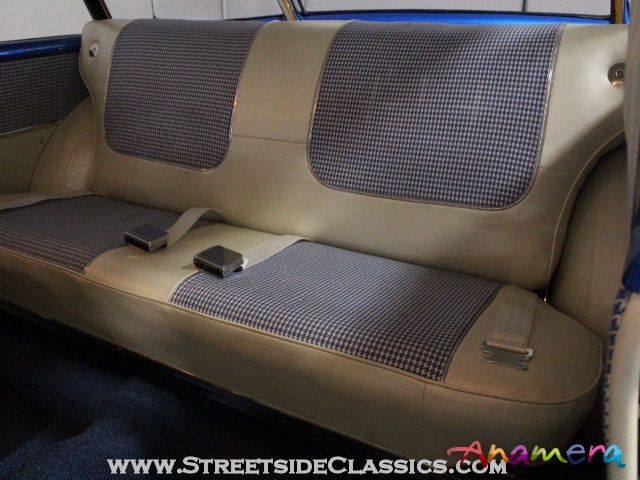 The front bench seat, however is a correct piece with tilting back rests for access to the rear seating area. New carpets with the correct weave and nap were installed and custom door panels were created using the original pattern and the modern materials. 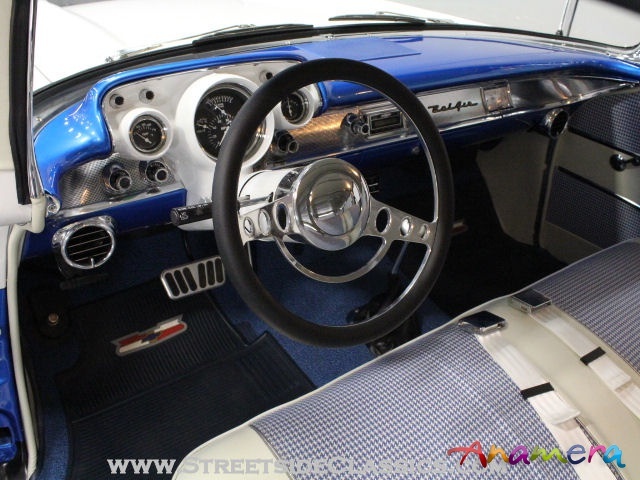 Of course, it's got all the modern conveniences like A/C, a tilt column, and a modern stereo system, but none of it detracts from the fairly stock-looking dashboard. 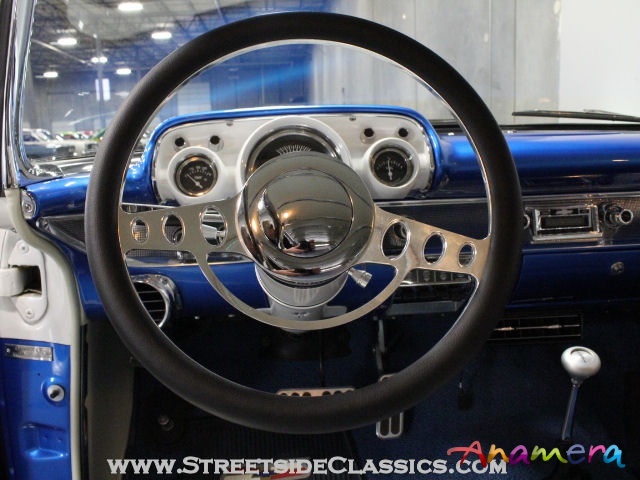 The steering wheel is a modern billet piece that looks quite at home in the '57 and the original instrument panel is filled with modern gauges from Classic Instruments. 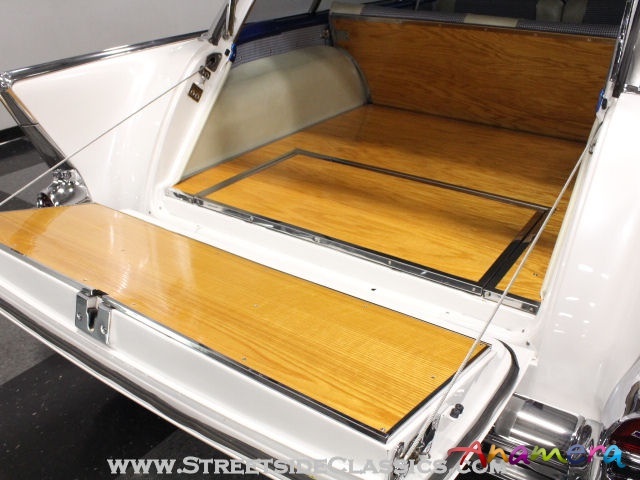 In back, there's a gorgeous cargo bay that's just too nice to use for hauling anything, but the solution is the custom-made quilted bed liner that matches the upholstery and protects that gorgeous oak. 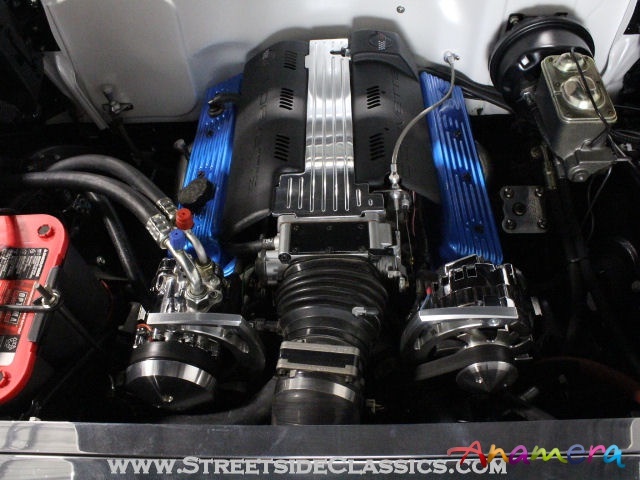 It's still got Chevy power, delivered in the form of a fuel-injected Corvette LT1 V8. 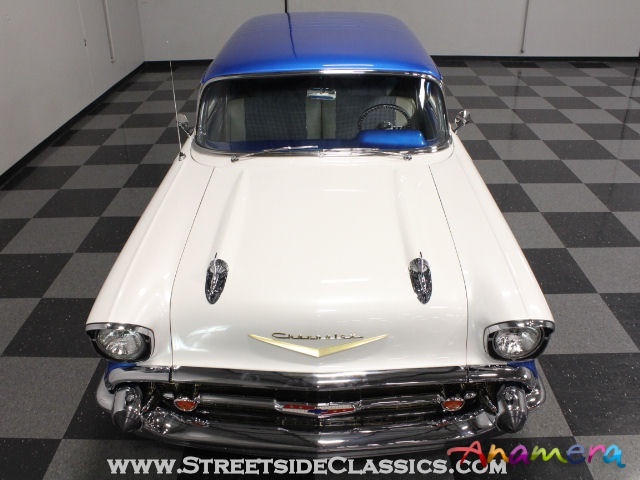 It's a tidy package in the '57's engine bay, and with color-matched valve covers, a lot of polished aluminum and a serpentine belt drive accessory system, it looks fantastic. A lot of effort went into hiding the wiring and plumbing, so the look is ultra-clean, yet serviceability is quite good. Power 4-wheel disc brakes, a lowered suspension with tubular A-arms up front, and fat sway bars at both ends means that it drives more like a Camaro than a station wagon, and you can see that the chassis is as highly detailed as the rest of the car. A 4L60E 4-speed automatic transmission powers a 9-inch Ford rear end, and with 3.25 gears and a Posi inside, it just loafs along at highway speeds. Gorgeous 17-inch wheels are a new twist on an old favorite and wear 245/45/17 front and 275/40/17 rear performance radials. Every bit as amazing as it looks, this is the kind of car that makes everyone else stop what they're doing and have a look. And the good news is that it drives even better than it looks. Call today!